triggering admin scripts from a phone. This post is part of my "Unix fundamentals" series. Recent posts in this series include settling into Unix, standalone lexers with lex, and sculpting text with regex, grep, sed and awk. Update: Jeff Bonhag wrote to point out (correctly) that RSA is better than DSA for your private key. As recently as a 2001, it was not uncommon to log in to a remote Unix system using telnet. Telnet is just above netcat in protocol sophistication, which means that passwords were sent in the clear. As wifi proliferated, telnet went from security nuissance to security disaster. As an undergrad, I remember running ethereal (now wireshark) in the school commons area, snagging about a dozen root passwords in an hour. SSH, which encrypts and authenticates connections, had been in development since 1995, but it seemed to become adopted nearly universally and almost overnight around 2002.
system-wide client configuration is in /etc/ssh/ssh_config. system-wide daemon configurtion is in /etc/ssh/sshd_config. Key-based passwordless authentication makes it less cumbersome for other programs and scripts to piggyback atop SSH, since you won't have to re-enter your password each time. Key-based authentication exploits public-key cryptography to prove to the server that the client owns the secret private key without revealing the key. To set this up, first log in to the client machine. This will place the private key in ~/.ssh/id_dsa and the public key in ~/.ssh/id_dsa.pub. Guard the private key (set appropriate permissions) as if the private key were your password. In effect, it is. Now, append the contents of ~/.ssh/id_dsa.pub to the end of ~/.ssh/authorized_keys on the remote machine. Do not copy your private key over. Now, when you connect to that account, it won't require a password. For copying data and files over SSH, there are a few options. It's possible to copy with the command cat. If you're trying to copy the output of a process instead of a file, this is certainly a reasonable route. If these are going to be large files, you may want to use the -C flag to enable compression. For copying files, the program scp works like cp, except it also accepts remote destinations. For an FTP-like interface for copying files, use the program sftp. You can set per-host configuration options in ~/.ssh/config by specifying Host hostname, followed by host-specific options. It is possible to set the private key and the user (among many other settings) on a per-host basis. The first example enables batch mode, which means it will never ask for a passphrase or password for this host. It also disables an escape sequence, which avoids any hiccups when transmitting arbitrary data. If ssh is to be invoked within scripts, this is a good option. The second example uses a HostName abbreviation, so that ssh mm is equivalent to ssh -i ~/.ssh/matt.id_dsa matt@might.net. The third example sets the user to u8193 for any machine in the subdomain lab.ucaprica.edu. See more options in man ssh_config. Port: set this to the port on which you want sshd to run. Unless you have a compelling reason to move it, keep it on 22. PermitRootLogin: set this to no and then configure sudo to add a little security; another good setting is without-password, which will force the use of public key authentication for root. PasswordAuthentication: set this to no to disallow password authentication entirely and to require public key authentication. The man page for sshd_config summarizes the remaining options well. SSH allows secure port forwarding. For example, suppose you want to connect from client A to server B but route traffic securely through server C.
Then, to connect to B:remoteport, connect to localhost:localport. If you use add -g, then anyone that can reach A may connect to B:remoteport through A:localport. 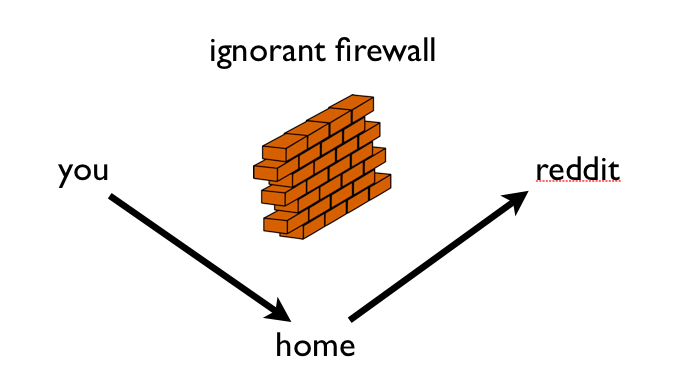 This is useful for evading firewalls. For example, suppose your work banned reddit.com. And, set the address of reddit.com and www.reddit.com to 127.0.0.1 in /etc/hosts. You will also need to disable any local web server running first. Now, it will surreptitiously traffic to reddit.com through your yourserver. Alternatively, suppose you wanted to give remote machine B access to another machine, A, by passing securely through your local machine C.
At this point, local users on B can connect to A:targetport through localhost:remoteport. SSH can also set up a SOCKS proxy to evade a firewall. In Firefox, under Preferences > Advanced > Network, select "Settings." Set your SOCKS5 proxy to localhost port localport. Test it out by googling "what is my ip." Firefox will now forward your web traffic through host. A word of caution: this will not forward your DNS requests. If you need to hide your DNS requests as well, I recommend installing DNSCrypt from OpenDNS. Using the FUSE project with sshfs, it's possible to mount a remote filesystem over SSH. On the Mac, use Fuse4x. Sometimes, you need to get to your home machine from windows. In these cases, you want the PuTTY suite of tools. Using SSH from iOS can be cumbersome, but the iSSH app is particularly well-suited to administrative tasks. The iSSH app allows storing configurations, which enables per-machine private keys and remote commands to run upon connecting. So, you can create a configuration that logs in to run a shell script. a script to reboot the entire server.